This was the year with the long, hot summer. 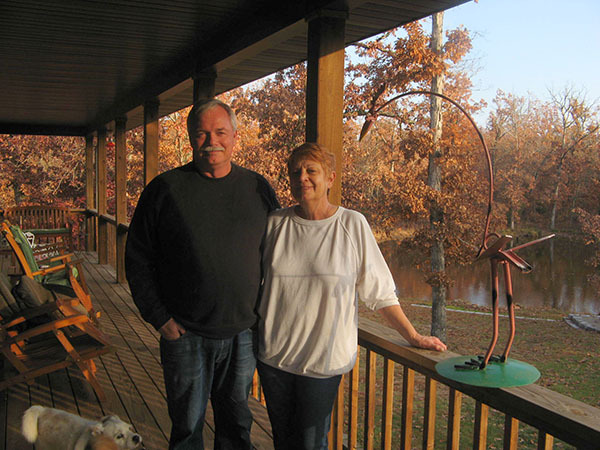 We began the year with a cold winter, followed by a cold spring, 10 degree below normal. That was followed by a week of nice weather and then the summer started - and stayed 10 degrees above normal. Finally this fall the weather moderated and we were able to get some work done outside. Also, this was the year we were invaded by Hydrilla. (pronounced high-drill-uh) Dealing with that was an adventure all by itself. Hydrilla out in the pond. Hydrilla is that leafy plant they put in fish tanks. It grows prolifically in fish tanks and open ponds. If you look into the water in the photo above, you will see a green foliage mass under the water a few feet out from the shore. During the long hot summer, we had little rain. By the end of summer, the water level had dropped so that the shoreline had receded to the near edge of that green mass. The Hydrilla was growing to the water surface and spreading rapidly towards the center of the pond. 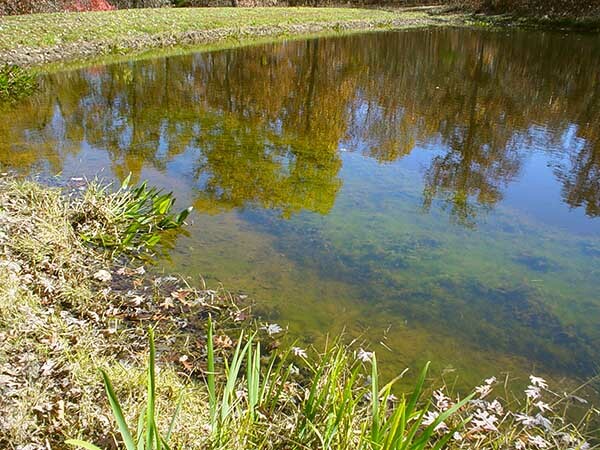 At the rate it was spreading, there would not have been much open water in our pond by winter. We decided to take action. We put 10 Asian Grass Carp into the pond. Those fish eat foliage and their favorite food is Hydrilla. Unfortunately, when they are bought, they are only about 8 to 10 inches long. It will take a couple years before they get big enough to do much damage to our Hydrilla. So... The wonders of modern chemistry help out until then. There is a chemical that is especially effective at stopping Hydrilla. One of the brand names is White Cap. 16 ounces of that stuff sprayed around in our pond effectively stopped the spread. It works by blocking the production of carotene in the leaves so the chlorophyll is broken down by sunlight, block plant growth. What you are actually seeing in the above photo is the remaining Hydrilla mass with a partial covering of filamentous algae that developed as the Hydrilla started dying back. Don't worry though, the Grass Carp still have plenty of Hydrilla to eat and are growing quite rapidly. They are already over 16 inches long. They will probably be twice that by the end of next summer. I'd have some photos of them, especially since the Hydrilla has caused the pond water to become sparkling clear, except they are very shy. Any activity around them and they instantly drop down and hide in the Hydrilla. Maybe next year I can get a photo. In spite of the blazing hot summer, we did complete one project. 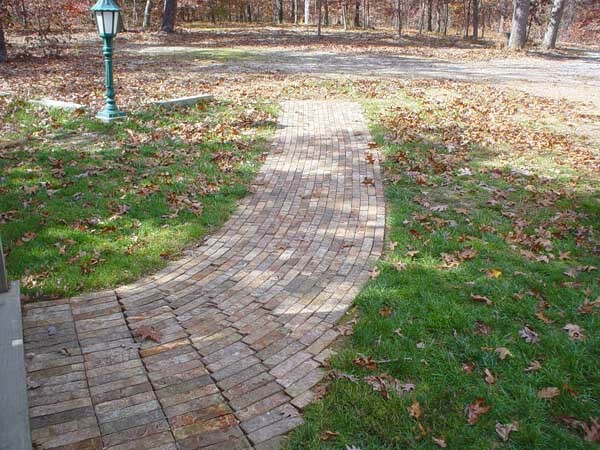 We put in a brick walkway between the guest parking area and the porch. It took us weeks to finish it. With the heat, we worked only an hour or two each morning. When we could work, we used a beach umbrella and a big electric fan to keep cool. We got it done though. It doesn't look very long in the photo but it is actually over 30 feet long. As you can tell from the photo above, we put a little extra work into this project. You will notice the bricks are set on edge. 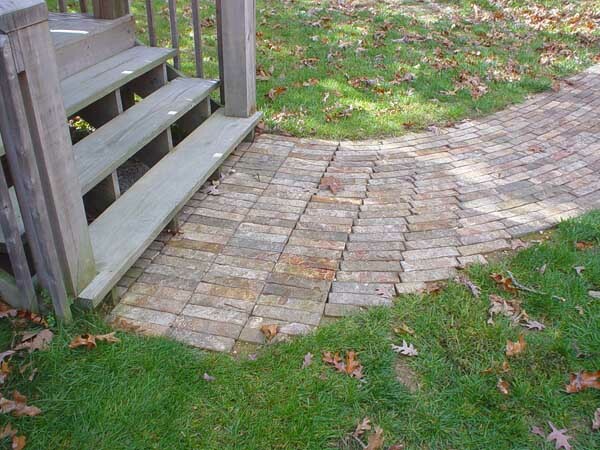 This is necessary since they are actually wall bricks, not pavers. We set the bricks on three or four inches of pea gravel for winter drainage. 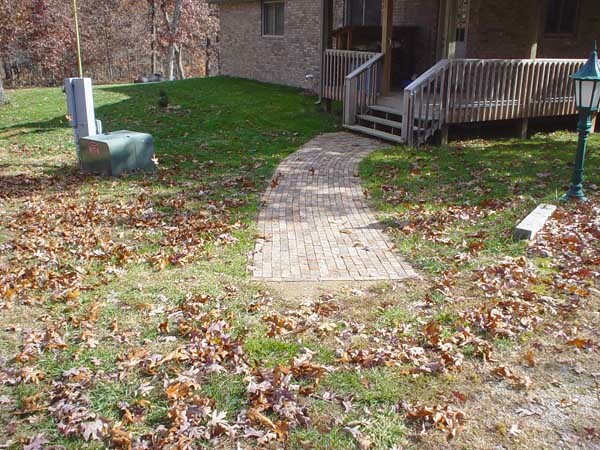 The brick surface is set even with ground level for easy mowing and so as to not trip visitors. That meant we dug down abut 8 inches through our hard rocky ground. You might also notice that we took advantage of the walkway excavation to run power out to a small street lamp. We have that on a timer so it is on for a few hours after the sun sets. It gets really dark out here in the woods some nights. Visitors appreciate the light. Another tree bites the dust. Even our mighty Oaks can get old and weak. This particular tree was beginning to slowly die back at the top. It was leaning out towards the carport. We decided that it was time to have it taken down before an ice storm could come along and pull it down. We paid to have a tree cutter come out with a bucket truck and take it down in chunks so as to minimize damage to stuff near the tree. We clean it up once it is down. It is cheaper that way. Besides, we are retired so have the time. 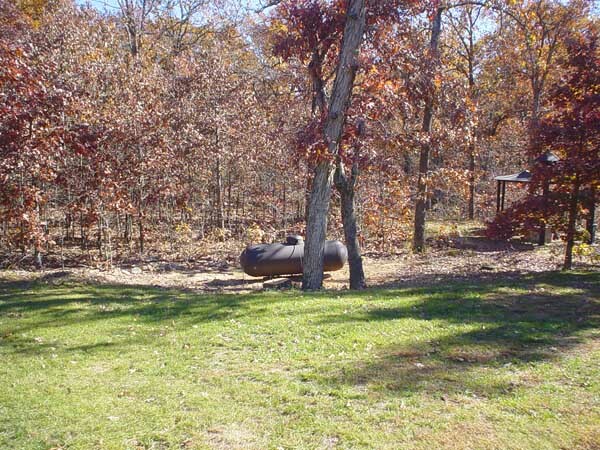 The brown thing is our propane tank. The photo above shows what it looked like after we cleaned up that tree shown in the previous photo. Faith painted our propane tank brown so it blends into the background better. When it was white, it dominated the view. Just one limb hanging over the barn. While we had the tree cutter here, we had some additional work done. There was a large limb that hung over the barn that we were starting to get nervous about. That is what you see in this photo. 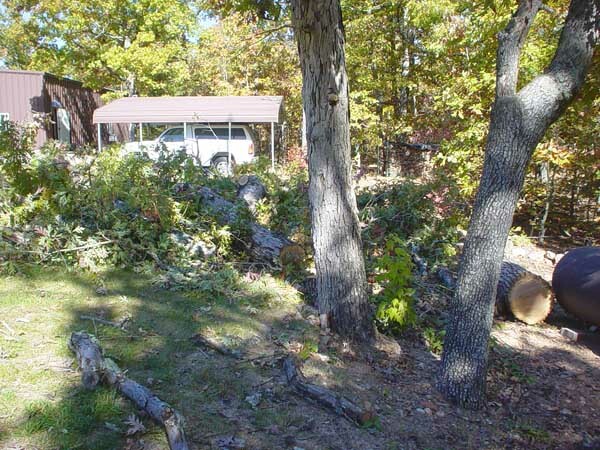 We had two other trees behind the barn taken out also. They were along side where the trench for the water, electric, and sewage lines up to the RV site was run. The trenching through their roots had eventually weakened them. They were starting to die back. 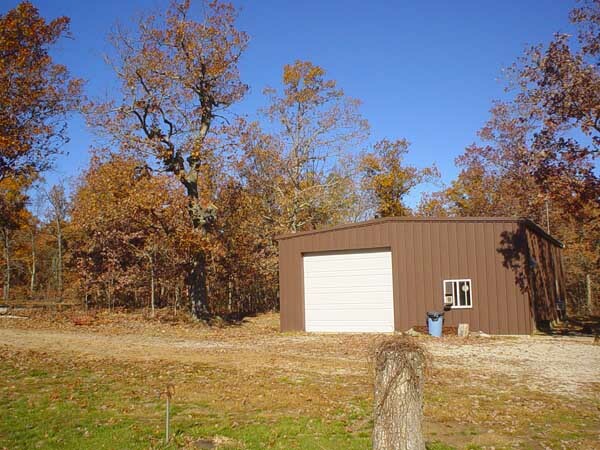 The barn with the overhanging limb gone. 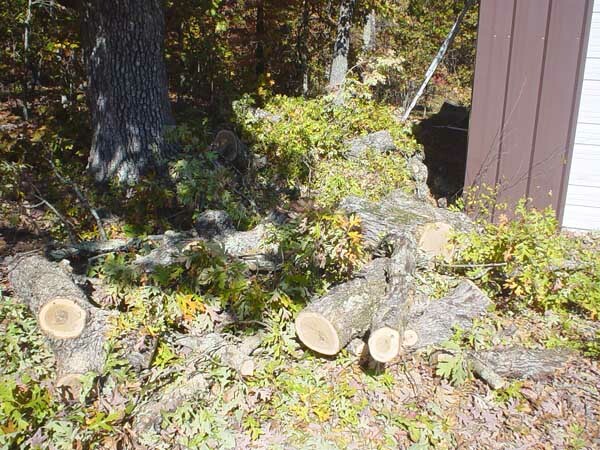 Once you clean up all the limbs and leaves and haul the larger stuff to the wood splitter, it doesn't look like you did any work. Wood ready for the splitter. 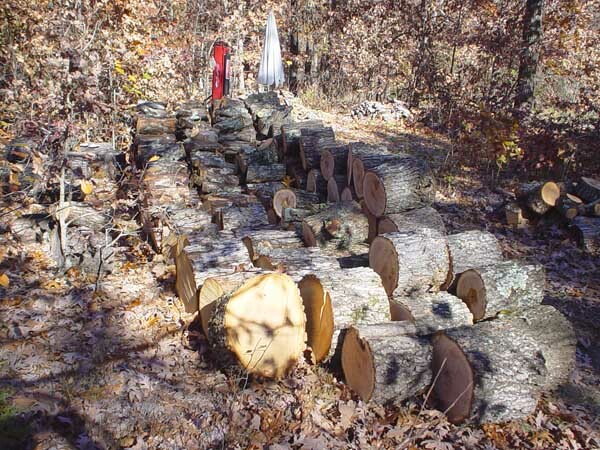 When I cut trees up for firewood, I cut them to the 15 or 16 inch length used in our woodstove. That allows drying to begin even before I split the the rounds. 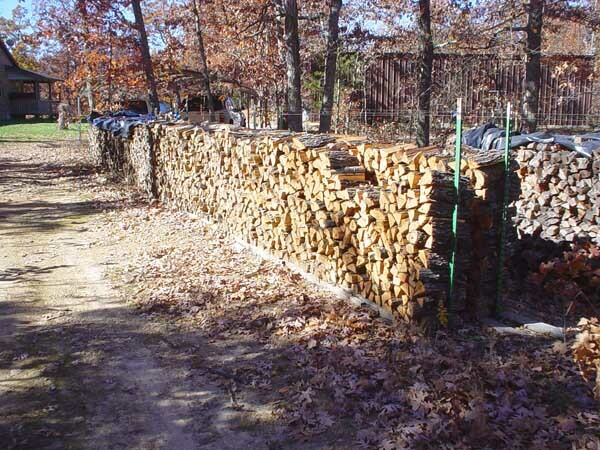 What you see piled above will be about a cord and a half once it is split and stacked. You can see the top of the splitter at the far end of the pile. It is about 7 feet tall. I use it in the vertical position. That allows me to split the wood without having to lift it off the ground. I sit in front of the splitter like I am milking a cow. That is much easier on the back. The umbrella is for shade when splitting on a hot day. After all the work of cutting and splitting, it is satisfying to see the results neatly stacked. This year, we are starting with wood left over from last year. It will probably be Christmas before we start taking wood from the nearer rack. Last year's wood is that grayer looking row visible at the right edge of the photo. This has been a good year. We are very happy to be able say that absolutely nothing of any consequence happened since last fall. We even managed a little travel and sightseeing. Hopefully, next year will be just as uneventful. Isn't that what retirement is supposed to be?